Are decals similar to stickers? Is there a background on your decals? Can you explain the measurements to me? I purchased over $75, where is my shipping discount? What surfaces can I apply the designs to? Can the decals be reused? Can the designs be used in high humidity areas such as bathrooms? Can I use the designs outdoors? What about using decals on textured walls? Can the designs be applied to tile? I just painted, do I need to wait to install the decals? Can vinyl lettering be cleaned? What sizes do the designs come in? I need lettering that is a specific height, how do you measure the letters? There are so many color choices, can I get a sample? Can I get a wholesale account? I bought my decals a few months ago, can I still install them? Are your products made in the US? I installed the decals, but I still have bubbles, HELP! Any tricks or tips for installing on glass or mirrors? Can I put the decals on canvas? How do I install decals on uneven surfaces such as paneling or tile? Any tips or tricks for installing decals on curved surfaces? Is my credit card safe when I shop with you? I thought the price was X but it is showing as Y! Why is that? How do I install this giant decal? I still have questions you haven't answered! Vinyl lettering is pre-spaced letters or graphic designs made from very thin pieces of vinyl which are flexible, durable, and washable. Because of their extreme thinness (about 3 layers of paint thick) and matte finish, the designs look as if they have been expertly hand-painted on your surface. Each vinyl piece is backed with a light adhesive for easy application to walls or other smooth surfaces. Our decals are cut from single color rolls, not printed, so you do not have the appearance of any “backing” to the letters. Each letter sticks to your surface by the adhesive on the back of the vinyl. We use only the finest quality material available, so you know that your design will look beautiful and painted on. The designs stay in place until you are ready to remove them, and removal is easy. Simply peel them back up. 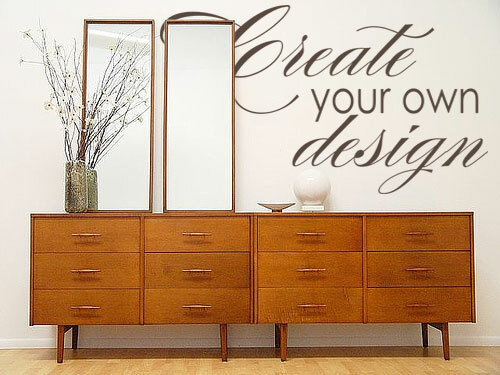 This makes our decals an ideal decorating option for both homeowners and renters. With vinyl lettering, you get the unique look of stencils without all of the hassle. Are the designs similar to stickers? Our vinyl lettering does not look like a sticker when applied to your surface. The designs are cut from a single color roll of vinyl and are not printed, which means there is no clear outline or backing to the design itself. 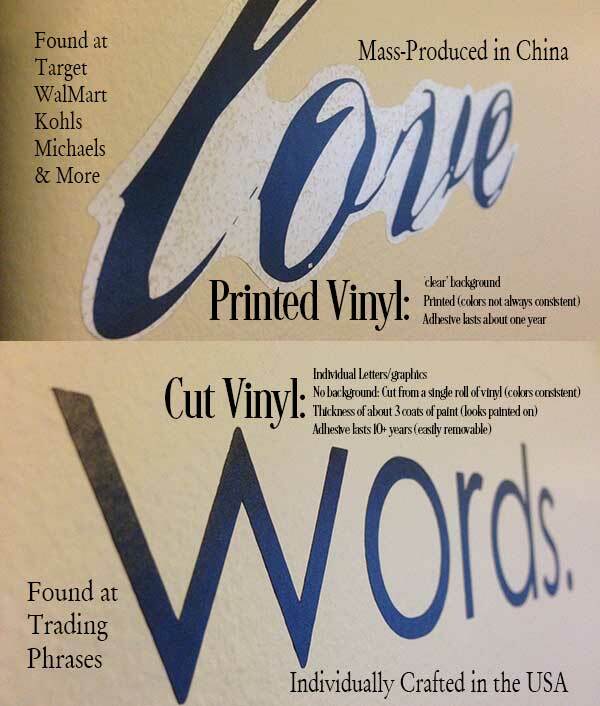 When you receive your Trading Phrases design, simply peel off the backing paper and apply it to your surface. The expressions come as entire phrases and are perfectly spaced and aligned according to the design. The vinyl sticks to the surface directly with its own adhesive. 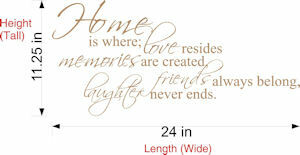 Our designs are of a very high quality and do not resemble stickers as do some competitor products in the marketplace. This article goes a bit more in depth about the varieties of decals on the market. 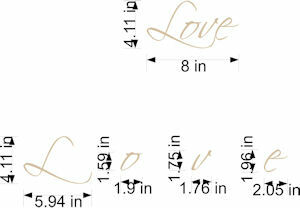 The designs are generally measured in Length/Width x Height. So a design that is 24 x 11 would be 24" wide, and approximately 11" tall. This measurement is for the overall design, with all lines included. Most of our designs have at least 2 sizes available. If you need a specific size that is not listed on our Web site, please contact us and we will let you know if the design is available in your requested size.. I need letters that are a specific height. How do you measure the letters? Our designs are measured in terms of overall width and height. Overall height for the entire design/decal means the height of all lines of text combined. Measuring by an individual letter size is difficult unless the font is an all caps, one size style which most designs are not. Overall size is used as the measurement to accommodate the variation between capital letters, lower case letters, and letters with hanging elements (e.g., g, j, y, etc). 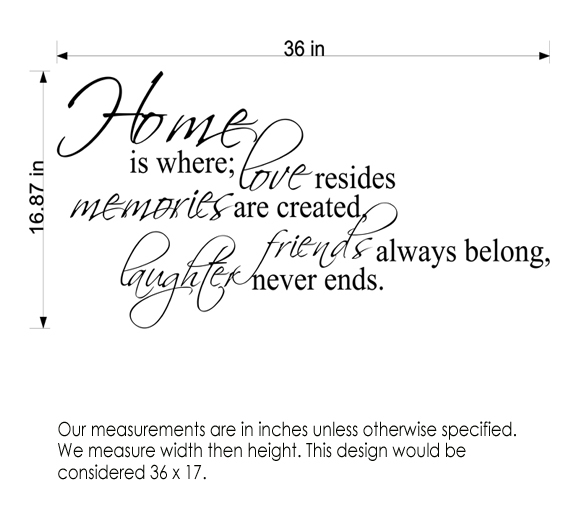 If you need a design in a specific height, please let us know and we can try to accommodate your request if possible. Some fonts are easier to work with than others. The example below shows some of the variation in letters, and why it is confusing to ask for them all to be the same size. I thought the price was X when I added it to my cart but now it is XY! Why is that? 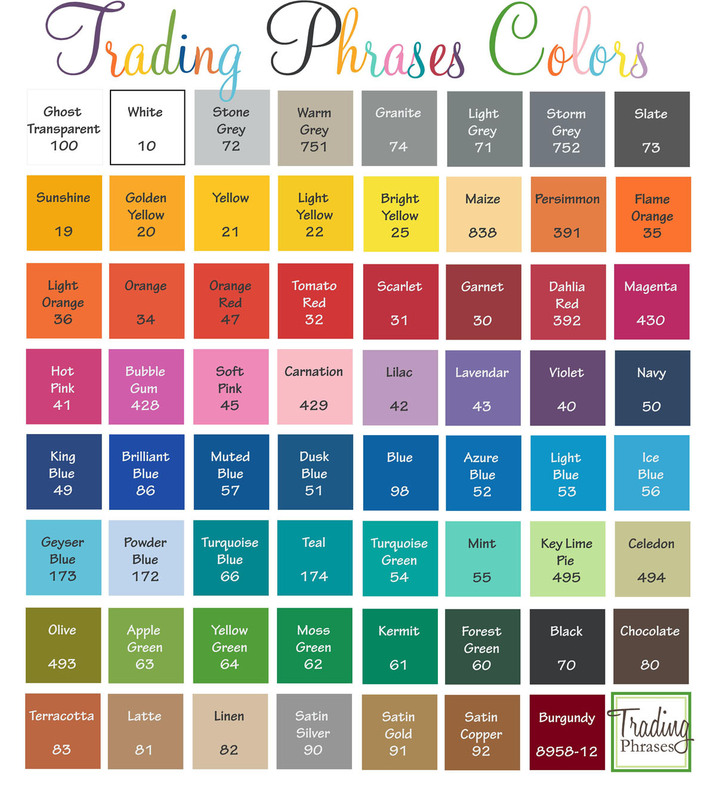 Trading Phrases charges based on the amount of vinyl we use- so larger sizes generally cost more. The price you see at the top of the design is our base price we charge for the smallest size, the drop down with sizes will have parentheses next to each size with a +number. The +number next to the size is how much the base price would increase if you order that size. For example a design that is $20 at the smallest size may perhaps have a drop down with sizes that are x(+5) y(+10) and z(+20) so your total cost for that item for each would be x$25, y$30 and z$40. Please contact our customer service if you have additional questions about sizing or pricing. I purchased over $75. Where is my shipping discount? The shipping discount is calculated automatically and is bundled with any other discount you received. Please note that gift certificate purchases do not count toward the $75.00 free shipping minimum. Any cart with a subtotal over $75 after discounts will get free shipping automatically. Please verify that you are not looking at the optional rush shipping charge rather than shipping fee, and be sure to choose the Free Shipping option manually. Good: The designs can be applied to most smooth, hard surfaces such as wood, walls, windows, doors, and mirrors. You can even apply them to appliances like refrigerators, dishwashers, and washers and dryers. For best results, apply the designs to clean, non-porous surfaces. The decals can be applied easily to ceramic or natural tile surfaces, but please note they have a matte finish which may contrast with a very shiny surface and decals do not adhere well to grout lines. Decals also hold up well in humidity, so applying them in your bathroom or even inside your smooth tub should not be a problem. Bad: The lettering will have trouble with rough surfaces, dirty walls, some glossy paints, or to paint that is not well bonded with the underlying surface. If you have any questions about whether the designs will work with a particular surface, please contact us before purchasing. If you have troubles getting your decal to stick, try reading our blog about sticking problems on this blog. Ugly: It is very challenging to get decals to stick to fabrics or canvas materials, brick or stucco due to the porous nature. We also do not recommend your decals go on a surface that exceeds 80 degrees or that experiences a lot of wear through the day. 1. Use the Hinge Method found in the Installation Instructions to position your decal. As you burnish your design, you may want to use a cloth or your thumb to press the vinyl into the grooves of the textured wall. 2. If your design is not transferring from the tape to the wall, before removing the transfer tape, get a spray bottle or a wet cloth and wet the back of the tape. Start to damp the tape and get it more wet if it is not releasing. This will help the decal release from the tape. Make sure your paint will not be damaged by excess water before you dampen your wall. Read more about installation on this blog entry. Do decals work on textured surfaces? Yes. We have sold thousands of decals and they have been applied on a variety of surfaces. Some are better than others, however. This article talks about some common textures and decals. Orange Peel: It is found anywhere a building boom occurred in the past 2 decades. This typical drywaller’s friend can be used with decals. Just use a bit of elbow grease to make sure you’ve gotten the decal into the crevices. Venetian Plaster: If you like the old world look, you may have this finish on one of your walls. The deeper the finish, the more work it will take to get into the hand troweled crevices. It will work with decals, but may lose the hand painted look up close. Use the installation tool to really work the design into the grooves. Sandstone: Add sand to a can of paint and voila, you have a sandstone finish. What you also have is a porous surface that makes a decal a bit tougher to adhere. Once it is in place, however, it looks beautiful on the relatively smooth surface. Tissue Paper: Some tissue and even wallpaper effects are heavy on the texture. Some are not. If you’ve got a heavier texture, it will take a little more work to get the decal in to the crevices. If you have the smooth version, well life is good! Textured Fresco: This is a relatively smooth texture, and it works really well with wall decals. The minimal texture shows through the solid pieces of the design, making the decal look like it has been painted on the surface better than some other textures. Glazing: This dramatic finish adds very little overall texture to the wall. This means it works really well with wall decals. The matte finish decal goes really well against the glazing and looks hand painted. Decals are a great compliment to your hard work on the glazing effect. Any tips or tricks for putting designs on glass or mirrors? Using vinyl letters on the glass of your favorite picture frame, a shower door, a glass block, or a beautiful mirror is quite fun. The interior metallic colors like silver, copper, and gold, have a soft satin-look finish that makes glass and mirrors quite elegant. Etched vinyl is another fun finish to glass and mirror projects. Keep in mind that when applying a design to any glass or metal surface, decals tend to adhere to these types of surfaces quickly, and they cannot be repositioned. 1. Always wipe your glass or mirror down well before starting. Cleaning the glass with a diluted vinegar/water mixture is best rather than chemical sprays such as Windex. 2. Take special care not to let the vinyl touch the surface until it is in the desired position. In some cases, you may want to remove any excess paper by cutting around the decal. 3. Choose the desired angle for the decal, and use the hinge method found in the installation instructions to hold the design in place. 4. To reduce the amount of bubbles hold up one end of the decal and pull it tight and burnish the decal slowly as you apply it to the surface, burnishing small portions at a time. 5. Remove the transfer tape. 6. Mirrored Expression Note: Because the back side of the design will be visible, air pockets may also be visible. To reduce the number of air pockets, hold up one end of the decal and pull it tight as you slowly burnish the design on to the surface. Glass is an excellent surface for our designs. Because of the smooth texture the vinyl adheres very well. However, because it adheres so well you must be sure that you have the design EXACTLY where you want it before applying it to the surface. The decal will stick IMMEDIATELY! To remedy this, we do sell a misting spray . This product, when sprayed on the surface prior to application of the decal, will allow the decal to be moved and repositioned for a brief period of time and also help with smooth out air bubbles. How do I install this on uneven surfaces such as beadboard or paneling? Check out this blog entry which covers beadboard in depth. When applying decals to a bead board surface, make sure you burnish the design starting at one end and slowly moving to the other. You may need to lift up one end of the design so it does not adhere to the surface before you burnish the vinyl into the grooves. Take special care to rub the decal into the ridges of the door and/or paneling. When removing the transfer tape, pull the tape off in the direction of the grooves or lines. Pulling against these grooves may pull up the decal. Any tips or tricks for applying decals to curved surfaces? When applying decals to curved surfaces, remove any excess paper by cutting around the design. With the backing paper still on, place the decal on the curved surface and mark the areas where the design doesn’t touch the surface. Make relief slits along the paper so the decal easily wraps around the surface (be sure not to cut the design itself). Slowly apply the design by starting at one end and moving to the other making sure everything lies flat. If the surface is glass, metal, porcelain, or any other smooth surface, take special care not to let the adhesive side of the decal touch the surface too soon, as these surfaces do not allow repositioning. Burnish the decal onto the surface and then remove the transfer tape. Can I put the designs on canvas? Yes, but keep in mind that the vinyl does not adhere to all canvases, so we recommend using a free customer sample to test your canvas before applying your expression. Canvases with a fine texture and/or a primed gesso surface work best. Canvas is not an ideal surface for decals, however. 1. If the decal is not adhering to the canvas, prep the canvas by painting the canvas or applying a layer of decoupage glue to the entire canvas before applying the design. 3. When burnishing the letters onto the canvas, take special care to remove the transfer tape slowly. Don’t pull the tape towards you. Instead, roll it off at an angle along the surface and at an angle. 4. You may need to use your fingers and press the design onto the canvas to help it adhere to the surface. To help seal the letters onto the canvas you can apply a few coats of decoupage glue after the decal is applied (this is optional). Can I reuse the designs? Unfortunately, the designs cannot be reused. The vinyl lettering is extremely thin and will stretch and tear as it is being removed. By removing the designs, you will also lose the precise positioning of the letters as well as the adhesive. If you would like your decal to move with you we recommend applying it to a mirror, painted wood, or another decorative surface that can move with the decal and be displayed. Can the designs be used in rooms with high humidity like bathrooms? Yes. Humidity does not affect the performance of the lettering. Just make sure you apply the designs to surfaces that are dry and clean. One of our designers has had her decal in her child’s bathtub for over 3 years! There is a little wear from the child knocking it, but otherwise the decal looks great! Yes. The designs can be used outdoors but do not apply them to your surface during freezing or very hot temperatures. For extra durability, consider purchasing our outdoor rated vinyl lettering which comes in black or white. This special lettering works extremely well on outdoor surfaces such as car windows, mailboxes, and front doors. If you need a design in the outdoor rated vinyl, please contact us. I just painted my dining room and want to install the design. Is this a good idea? We recommend waiting at least three weeks before installing the vinyl lettering on a newly painted surface. Paint gasses out (you know that fresh paint odor you still smell weeks later) for several weeks and during this time it is releasing gasses that make installing decals on your wall a challenge. Yes. To clean your design, use a mild household cleaner, a soft cloth or sponge, and a light touch. Avoid using cleaners that contain alcohol or rough abrasives. There are so many color choices. Can I get a sample of them to select my design from? Yes, simply submit a sample request form which allows you to choose up to 6 colors. Once we receive your form, we will process your request quickly. How in the world do I put up this giant tree? First, you need to lay the pieces out and determine the placement of each. Choose where you want the tree to be placed. Begin with the trunk portion and tape the design on the wall where you want it. Be sure it is level and centered. Using the tape as a hinge, carefully peel the backing paper away. (*tip* - I actually work my way from the bottom up when applying the tree trunk). Carefully peel the top layer away and smooth down any bubbles or lifted areas with the installation tool. Carefully line up the next piece, making sure it is properly aligned. Follow the same installation instructions as you used for the first piece. Repeat this process for each piece of the design. Once you have all of the tree pieces up place the leaves/blossoms where you want. The result should be a beautiful tree that will add lots of character to your home. How do I remove the designs? Removal of the designs is easy. Simply place a finger under one of the design edges and peel up, much like you would remove a sticker from a flat surface. Designs that have been in place for a long time may require a little extra effort to remove. For these designs, simply heat with a hair dryer for a few minutes to loosen the adhesive before trying to peel the edges. Wipe clean any remaining residue with a soft damp cloth. Due to constantly adding design choices to our inventory, we do not maintain a catalog. You can view all of our designs on our website. We strive to have a very small impact on the environment and even a smaller one on your wallet. For these reasons, we do not publish a paper catalog. Wholesale accounts are available only to professional designers and decorators at this time. While we have been asked to provide our designs to retail stores, we have found that vinyl designs that sit for several months are generally more difficult to install. To us, every design is a custom cut and is tailored to the purchaser’s individual size, color, and style choice. It is difficult to find the perfect mix for retail sales given thousands of customization choices on our online catalog. Design professionals can find information about creating a trade account here. Gift certificates can be purchased here. Please let us know if you would like a paper gift certificate mailed to your recipient, or alternatively we can email a gift certificate number which your recipient can use online. The email option will avoid the purchaser having to pay shipping for the cost of mailing the paper certificate. I purchased my designs a few months ago, can I still install them? We recommend installing the designs when you receive them for best results. The designs get more difficult to work with over time, and may not adhere to the surface if they sit for more than 60 days. However, you should still try- we’ve had customers successfully apply decals that are over 2 years old. It can depend on how it is stored. Are the products made in the US? As a small family company located in Columbus, Ohio we pride ourselves on making everything in house. Our customer service, design and production services are all in one building- and if you call in, we will answer! We source our raw materials from companies that operate in the US as well. I installed the designs using your directions, but still have bubbles. Help! Bubbles naturally form under vinyl, especially with glass and mirrors. The best way to remove little bubbles that don't press out under your vinyl, is by using a little straight pin or safety pin. Just poke a little hole, and press it smooth. We process orders daily, and we currently are using USPS as our carrier. If you choose free or flat rate shipping, we will use the lowest cost rate to ship your package, generally First Class (shipments less than 13 ozs) or Priority 1, 2, or 3 day delivery depending on the distance from Columbus, OH 43235. Rush Processing simply moves your order to the top of the daily queue to ensure we get it out that day. It does not include expedited shipping (Rush processing is automatically included in express shipments). You will receive tracking information with every shipment, but tracking generally only works for Priority or Express packages. First Class shipments can take up to 10 days to arrive. If you haven't received your package, please contact us to see if it can be tracked or replaced. Is my credit card safe if I shop with you? When you shop at Trading Phrases, your credit card information is 100% secure. Each payment transaction is sent over an encrypted network using a secure (HTTPS) connection. The payment details are handled and maintained with the payment provider (Google Checkout, PayPal, or Authorize.net for credit cards and e-check transactions). Our own staff cannot view any credit card details, nor can any customer accessing our system. We do not retain any credit card information at our website or in any of our databases. You will not be charged sales tax when ordering, unless you are located in our home state of Ohio. If your business is located in Ohio, you can apply for tax exemption right at checkout! Before proceeding to checkout, make sure that you are signed into your account. If you do not have an account, simply click Register at the top right of the page. Once you create an account and are signed in, go to your cart and click Checkout. You will see a link under your Order Summary that says "Are you tax exempt?". Once clicked, a Purchaser Certificate of Exemption will pop up. Simply fill out the required information and click Save this Exemption Certificate. Then verify in your Order Summary that sales tax is not being charged, and click Submit Order. Now you're all set up, and you will not be charged sales tax on any of your future orders as long as you are signed in! When you are on the Checkout page, click the link that says "Referral code", underneath your order total. A box will open for you to enter your coupon code. Click the arrow to the arrow to the right to apply the code. Be sure that your discount is applied to your order total before you submit your order. Coupons cannot be added retroactively to your order, so if you have any questions or problems, please do call us or send us an email so that we can help you before you place your order. I still have questions, where can I get more help?